Rob Henry, who spent two years with the youth team at Burnley, has left Lancaster City, where he’s been for the past nine years, and signed for Ramsbottom United. 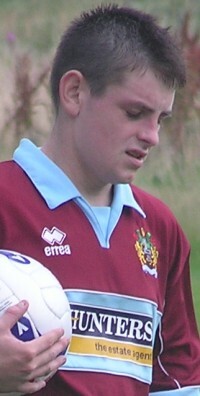 Henry joined the Clarets as a 16-year-old in the summer of 2004, one of a number of new scholars alongside such as Kyle Lafferty, Chris McCann and Cayne Hanley. The full back wasn’t offered professional terms at the end of his scholarship in 2006 and has played non-league football since with a number of clubs that include Leek Town, Bamber Bridge and Chorley. He left Chorley for Lancaster in the summer of 2009 and has been with the Dolly Blues ever since, eventually becoming a player/coach. Now a teacher at Myerscough College, Henry is also a long serving coach within the Preston academy and last year completed his Advanced Youth Coaching Award, a qualification on a par with UEFA ‘A’ Licence. Ramsbottom will play in the Evo-Stik League, West Division in 2018/19. That’s one division below Lancaster who, with Henry, won promotion to the Premier Division in 2017.